First, we need to create an OptionRepository interface extends from the ReactiveMongoRepository interface to manipulate the MongoDB database. 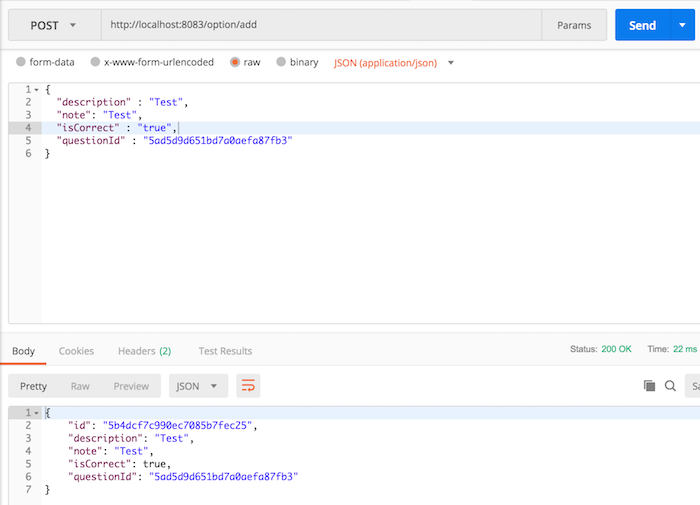 You can see the tutorial Reactive REST APIs with Spring Data MongoDB Reactive and Spring WebFlux for more information. Next I will configure the connection to the MongoDB server. OK, everything is ready, now we will go to the main part of this tutorial. With this declaration, I expose APIs for the Core Option Service with the request URL starting with “/option”. At this point, we have completed the API to create a new option for the Core Option Service, let’s test it. The last thing we need to do is add a new Unit Test to the code we just added. I will create a new class called OptionControllerTest located in the src/test/java package to test the OptionController class. Run “Maven test” in STS or “mvn test” with Apache Maven, you will not see any errors.